Healthy snacks and eating tips for when you're active. Take a hike—and a snack. 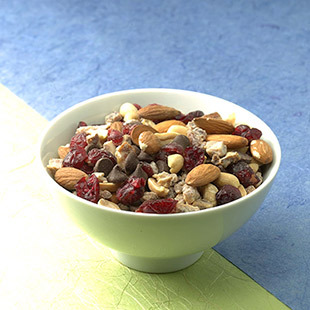 Trail mix is a great, easy-to-make, on-the-go energy-boosting snack that you can individualize to your own tastes and desires. Use this recipe as a starting point: combine equal parts whole almonds, unsalted dry-roasted peanuts, dried cranberries and chopped pitted dates. Toss in a handful of chocolate bits for a special treat. A 2-tablespoon serving gives you potassium, protein, monounsaturated fat, fiber, vitamins E and C.
Balance your electrolytes. Potassium works with sodium to help maintain the body's fluid balance, regulate blood pressure and contract muscles (such as the heart). Yes, bananas are a good source but so too are broccoli, cantaloupe, oranges, papaya and spinach. Try to work one—or two—of these foods into your diet today. Flex those muscles. In addition to eating a healthful diet, weight-bearing exercise, such as walking, aerobics, basketball or weightlifting, also helps keep bones strong. So press some light dumbbells into service or play a quick game of basketball and keep those bones dense and strong. Strong bones…oh, K! Yup. Vitamin K is an important activator of three proteins essential to bone health. Just one daily serving of spinach (1 1/2 cups fresh) or two of broccoli (1/2 cup per serving) more than covers your daily recommended intake for this nutrient as well as others such as vitamins A and C.
Pack along sugar and spice and everything nice. For a spicy energy mix to bring on the hiking trail or just to eat as a midday snack, combine 1 ounce dates, 1½ ounces dried mango, 1 ounce pepitas (pumpkin seeds) and ¼ teaspoon prepared spice rub. This sweet-and-spicy combination will give you 5 grams of fiber plus 13% of the Daily Value for potassium, 43% DV for vitamin C and 26% DV for iron. Make healthy cookies in no time. For easy healthy no-bake cookies, finely grind 2 whole-wheat graham cracker squares and combine with 1 tablespoon raisins, 1 tablespoon smooth natural peanut butter and 2 teaspoons honey in a small bowl. Pat into 2 cookies and press lightly in unsweetened coconut. This soft and sweet snack will give you fiber, protein and potassium. Go for high-fiber fruits. Eating a variety of fruits is a great way to get more fiber. Try including these top three fruits—each supplies 3-plus grams of fiber per serving—in your daily intake: pears (up to 5 grams per 1 medium), raspberries (4 grams per ½ cup) and apples (4 grams per 1 medium).